Signal Tower. Elk Mountain, Overlooking Battle-field of Antietam, Maryland. To the hero of Antietam belongs the credit of first developing and fully appreciating the value of a corps of signalists to an army throughout its active operations in the field, and especially during a great battle. His signal officers were most intelligently and advantageously posted, and seldom, even in later campaigns, had their assistance to a commanding general been more valuable, or more frankly and handsomely acknowledged, than in the momentous struggle on the Antietam. At intervals along our line of battle, and on the most prominent points in the vicinity, were stationed the Federal Signal Officers, detecting by their skill, vigilance, and powerful glasses, every movement of the enemy, reporting them instantly by a few waves of their flags to the Union Commander, and in return, transmitting by the same means the orders to the subordinate generals, which were to check or defeat the manœvres of the enemy. The adjoining sketch represents the most important of those signal look-outs, and was located on the summit of Elk Mountain, one of the South Mountain Range of the Blue Ridge, and overlooking the battle-field. 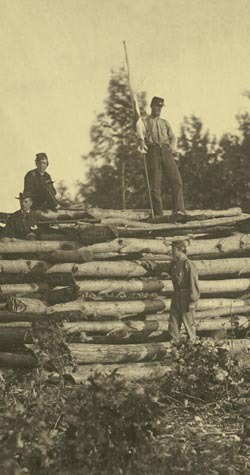 The Elk Mountain Signal Station was operated by Lieutenants Pierce and Jerome, and the view was taken whilst the former officer was receiving a dispatch from General McClellan, probably requesting further information in regard to some reported movement of his wary foe, or sending an important order to a Corps Commander.